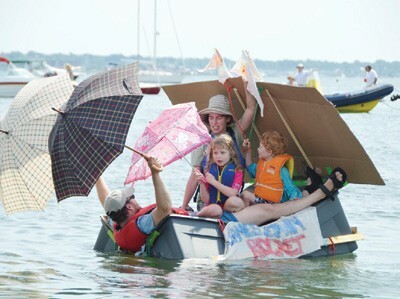 The 37th Annual Fools’ Rules Regatta was hosted by Jamestown Yacht Club in Jamestown, RI on Saturday, August 16. This event is open to everyone who likes to have fun and be foolish (and who doesn’t? ), and there’s no entry fee. Participants construct a “sailing vessel” from non-marine materials, and attempt to complete a 500-yard course along Town Beach. Revenue from merchandise sales is donated to the Conanicut Island Sailing Foundation, the North Kingstown High School sailing team, and the Joshua Leonard Scholarship Fund. Visit jyc.org to learn more.